I figured that I should spend my Euros while they still mean something. Not in Greece, though. Many teenagers cannot find work this summer, victims of a weak economy and a situation made worse by minimum-wage laws. Budget cuts for government youth-employment programs are a much less important factor. Employment rates among teenagers are much lower now than they were before the recession began. While some people blame cuts to summer youth-hiring programs by state, local and federal governments, even in the best of times these provide only a small fraction of summer jobs for teenagers. I used the Census Bureau’s monthly household surveys from January 2000 to December 2009 to calculate the amount that each industry’s employment of teenagers (measured as the sum of hours worked by all persons 16 to 19) during June, July, and August exceeded its average value in the months of April, May, September and October. For the economy as a whole, the average teenager worked 11 hours a week during the summer, compared with an average of eight hours a week during the academic year. Not surprisingly, the arts, entertainment and recreation industries provided more of those extra work hours – about 16 percent of them — than any other industry group. Accommodation and food services — that is, hotels and restaurants — provided 15 percent. Retail trade and construction were next among the job providers, with 11 and 9 percent, respectively. Local government was fifth, providing less than 9 percent of the extra summer work for teenagers. Even the combination of local, state and federal government hiring explained less than one-eighth of the extra summer work for teenagers (for the contributions of more industries, see Table 4 of this paper). The vast majority of summer youth hiring is done by the private sector, and even if government eliminated its summer youth hiring, that would hardly dent the total. Employment during recessions tends to drop disproportionately among low-skilled people like teenagers, so the latest recession has to be the biggest factor in explaining why teenage employment rates are so low today. If the government wants to help raise teenage employment rates significantly, a good way to start would be by reducing labor market regulation rather than spending tax dollars on youth employment programs. The home-mortgage interest deduction does not by itself significantly distort housing markets. Too much owner-occupied housing has been built because housing is excluded from sales and other taxes owed by businesses. The housing boom and bust of the last decade, and government revenue shortfalls, have brought back the topic of whether the government excessively encourages home building. Those discussions invariably mention the elimination of the home-mortgage interest deduction. This deduction allows taxpayers who own a home, have a mortgage and itemize deductions to reduce their personal income tax by including home-mortgage interest payments in their tax deductions. Homeowners rightly consider this when considering whether and how much to invest in a home and how much they should borrow. A homeowner who pays, say, one-third of his taxable income in federal and state personal income taxes will recognize that a $3,000 monthly mortgage-interest payment really only costs $2,000, because the mortgage interest reduces his taxable income by $3,000 and thus the personal income tax owed by $1,000 a month. It’s as if he paid $2,000 and the federal and state government treasuries paid the other $1,000. At first glance, the home-mortgage interest deduction would seem to cause homeowners to borrow excessively for home ownership, and thereby deplete government treasuries. But that ignores the fact that one person’s mortgage interest payment produces interest income for another person or a business. The lender may well owe taxes on the interest income. More home-mortgage borrowing means more home-mortgage lending, and the latter means more interest income that can be taxed. In theory, home-mortgage borrowing could even add revenue to the Treasury if the lender is in a higher tax bracket than the borrower (or if the borrower is not itemizing her tax deductions). Interest deductions are present in the business sector, too, and have the same essential properties as the home-mortgage interest deduction. A corporation that borrows to finance an investment project can deduct its interest payments from its taxable income, and that borrowing will generate interest income for whoever made the loan. Landlords can also take out mortgages on their properties and deduct the interest payments from their taxable income (that benefit may, in turn, affect the rent they set). In that sense, the possibility of deducting mortgage-interest payments from income taxes does not by itself discourage renting rather owning. In contrast, consumer durable goods do not enjoy the interest deductions that housing and business capital do. Someone who takes out a car loan to purchase an personal automobile cannot deduct the interest payments from her taxable income, even while the Internal Revenue Service may be collecting taxes on the interest income of the lender. In this regard, tax policy discourages investment in consumer durable goods relative to investment in housing and businesses. As it has for the last three summers, the economy’s regular seasonal cycle will accumulate yet more evidence against Keynesian models of recession labor markets. 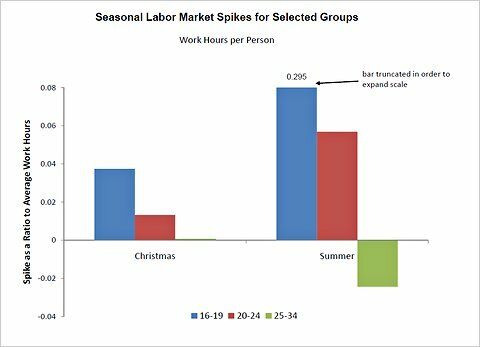 Two important seasons in the labor market are Christmas and summer. The Christmas season is an obvious time of high demand — people want to spend more in November and December. Basic economics says that Christmastime demand, while it lasts, raises wages, employment and hours, while it reduces unemployment. Employment and work hours are also high during the summer, and as you are reading this, employment is likely to be surging well above what it was a month ago (the Census Bureau employment data for June is not due out until July 8, and the July data not until a month after that). In the past, a few readers of this blog have given demand the credit for the summer job surge. In my view, demand contributes a little to the summer job surge (after all, agriculture, construction and other industries are expected to be more active when the weather is warmer), but supply is the primary reason that jobs are created during the summer. One basis for my opinion is that people in vast numbers become available for work when school lets out for the summer, and about the same number are no longer available when school resumes. For example, about 20 million people 16 and older are attending school during the academic year, and very few of them are working full time. Nobody knows the students’ intentions for sure, but certainly millions of them would like to work during the summer. I don’t know of any change in demand occurring over the summer that would number in the millions (even doubling the size of our military overnight would not create much more than a million jobs). It’s easy to tell the summer supply stories and demand stories apart. The demand story is a lot like Christmas — customers demand, employers want to satisfy customers, so they hire more workers. If the demand story applied to summer, then we should see summer employment and work hours surge, and wages increase, too, while unemployment should dip. 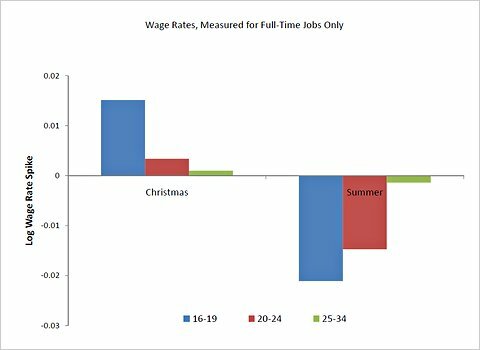 If I’m right that the summer job surge comes from supply — the increased availability of workers — then summer wages and unemployment should follow patterns opposite to Christmas: wages should fall and unemployment surge. The charts below display three labor market indicators — weekly hours worked, hourly pay for full-time jobs and unemployment — for the two seasons. (I use data from the Current Population Survey Merged Outgoing Rotation Group from January 2000 through December 2009). The charts show seasonal spikes: the level of the indicator during the Christmas season (November and December) or the summer (June through August), relative to the indicator during the four months near the season. Wages and unemployment are represented as a proportional change from their off-season values, and spikes in hours are expressed as a proportion of a group’s average hours for the entire season and adjacent months. Each group’s hours spike is positive on Christmas. During the summer, the hours spikes are positive only for the two younger age groups, which we expect because those are the groups attending school during the academic year and becoming suddenly available to work in June. All three Christmas wage spikes (middle panel) are positive, while all three summer wage spikes are negative. 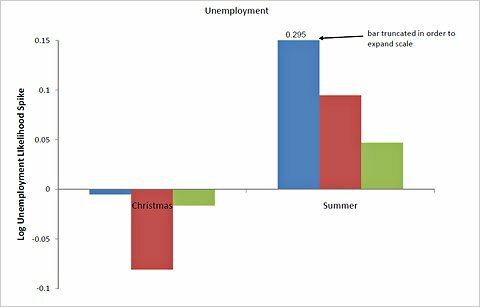 It’s hard to believe that summer involves the kind of demand surge we see over Christmas; summer wages and unemployment go in exactly the opposite direction that they do during Christmas. Thus, the summer job surge is nothing like Christmas. The economy creates jobs in the summer — even during the last several years, when our economy supposedly suffered from a lack of demand — because millions of people become willing and available to work. This is not to say that everything is working well in the labor market — employment is much lower than it should be — it’s just that greater labor supply remains one route to higher employment. As noted by Greg Mankiw, the Harvard economist, and Gauti Eggertsson of the New York Fed, the fact that, even now, jobs are created when people are willing to work is a big challenge to the Keynesian economic model that assumes that labor supply is irrelevant during recessions, liquidity traps and other labor-market crises. That’s why Keynesians contend that expanding unemployment insurance can increase employment, even while they know that it erodes work incentives. Yes, unemployment is too high and employment is too low, and I applaud Keynesian economists for trying to understand that. But they have gone too far and have ultimately given the wrong advice, in assuming without proof that labor supply is irrelevant. The labor market’s seasonal cycle shows pretty clearly that they’re wrong. Gov. Pat Quinn of Illinois is considering signing a bill that would prohibit state officials from publicizing lists of registered gun owners. The economics of crime suggests that such a list would put potential victims at a disadvantage and help criminals. Earlier this year, the state attorney general, Lisa Madigan, asked the Illinois State Police to make public its list of registered gun owners. Proponents of Ms. Madigan’s request say the Freedom of Information Act requires the state to release such information when requested. The police are concerned that a public list would discourage some gun owners from legally registering their weapon, and, as a result, the owner database would be less accurate precisely because it was public. A more accurate list, the police say, helps them protect officers and facilitates law enforcement. Economists know that information affects criminal activity – that crime is reduced when criminals see a greater likelihood that they will be caught or that they would face a stiffer penalty when convicted. 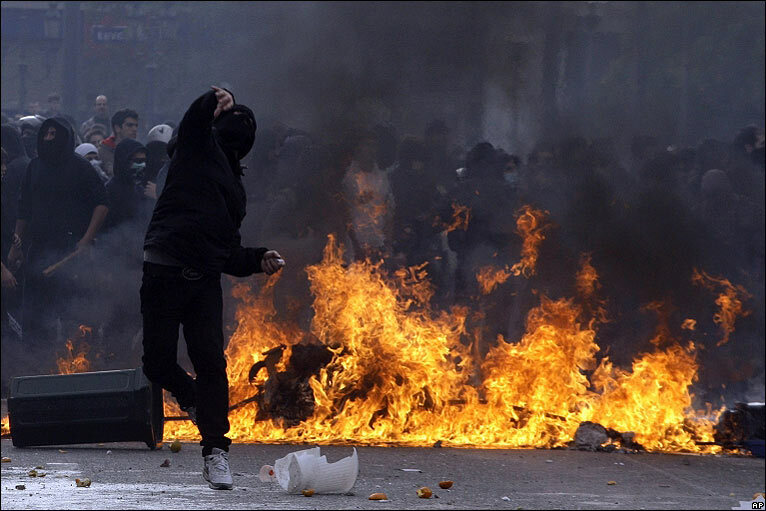 As in other areas of activity, studies show that criminal behavior is, on average, sensitive to the costs and benefits of committing a crime. Potential victims recognize this sensitivity and take steps to protect themselves. Sometimes they install locks and alarms, knowing that criminals may get through them but would rather spend their effort on another victim who is less well protected. Just as most criminals would rather avoid locks and alarms, many of them would rather commit their crime without being shot by a victim brandishing a firearm. Without access to a gun-owner database, criminals in Illinois may expect that any victim might use a firearm for defense. Making the list public would also permit criminals to select victims who do not appear on the gun-owner list, to lower the odds that their victim has a firearm for self-defense. Some criminals intend to steal guns. A public gun-owner list would help them, too. Either way, the public gun-owner list gives criminals choices — to target a gun owner or a nonowner, whichever better serves their purpose. Although some gun owners might refrain from registering their guns to keep their ownership private, other people might consider purchasing and registering their first firearm to avoid being known as someone who could not protect himself with a gun. In this way, a public owner list could increase the number of households owning guns and thereby increase the number of accidents and other undesirable outcomes associated with gun ownership. When it comes to Illinois’s gun-owner database, both gun owners and nonowners can benefit from privacy.